Yesterday, Chicago’s city council passed an ordinance banning all forms of smokeless tobacco from the city’s sports stadiums. That means no dip, no chaw, no snus, all informally part of baseball culture as long as there has been a sport where men sit around for three hours every day. And for the players addicted to the stuff, it’s going to be hard as hell. The ordinance kicks in in 90 days, and a first offense carries a fine of $250, the second $500, and any additional violations will cost $2,500. Let’s be realistic: no baseball player is likely to be busted for this. Unless the city is looking to make an example of someone, players can just retreat into the tunnel to spit, and if cameras catch them with a full cheek, who’s to say it’s not sunflower seeds or gum? But for those targeted by the ordinance, it’s about the principle of the thing. 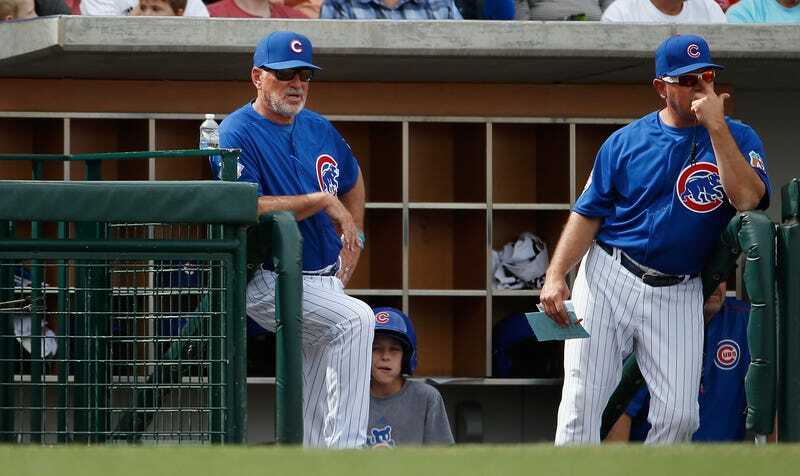 “I’m not into over-legislating the human race,” Cubs manager Joe Maddon said. “So for me, I’ll just have to listen and learn. “I stopped chewing tobacco about 15 years ago, and I’m glad that I did because I think I feel better because of it. I know the pitfalls. But I’m into education; education the masses and let everybody make their own decisions. That’s what I’m about. So to tell me what I can and cannot do as an adult –unless it’s illegal; that’s something different. This is the way the country is going: similar ordinances have passed (though not yet gone into effect) affecting ballparks in California and Boston, and New York City will vote next week. While there’s no secondhand smoke to make it as dangerous or as gross as actual cigarettes, these moves are part of the same policies that banned smoking in bars and restaurants, and have jacked up the cost of cigarettes in the last decade-plus. All with the same end in mind: if you make it difficult or expensive enough to consume tobacco, hopefully less people will use it, bringing health care costs down for everyone. “It’s going to be hard because you’re an addict, pretty much,” Cubs catcher Miguel Montero said. “It’s going to be tough to quit cold turkey. Hopefully, I can quit that, and hopefully that helps me to quit. It’s good to quit. It’s questionable to not let people make their own decisions on using legal products.